Give a woman her dream pair of shoes and she will go gaga over it to the point of using it until it worn out. But when you present here another pair of shoes which pass her taste, I am sure she will not let it down and think it over if she will buy another one. Women’s impulsiveness in buying shoes is associated to her wanting to be confident and I think glamorous. With comfortable and beautiful shoes is one important accessory to a woman. And because of this, it could make a better business idea too. If women is serious with their shoes, this could go that shoe business is also a serious business. Study the dynamics of the shoe industry. Here’s how. You decide on what particular shoes you are going to sell. According to Jenny Fulbright, PowerHomeBiz.com Staff Writer, in her article Starting a Shoe Retail Store, the type and quality of your merchandise will shape the image of your business. Customers will come and patronize your shoes due to the quality of your inventory. 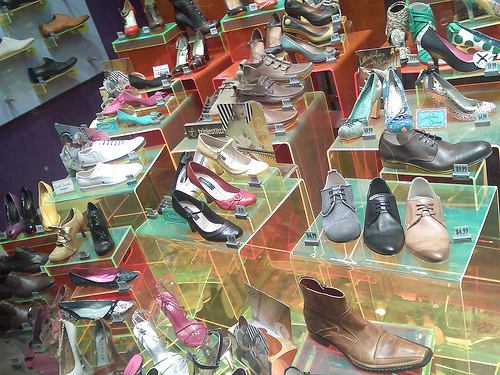 And according to startupbizhub.com, look for wholesalers of shoes if you want to start a shoes business. The internet has a large database of shoe wholesalers but it is important that you verify the credibility of the wholesalers you are dealing with. It is also best to get quotation from a number of shoe vendors so you will be able to know where it is best and cheapest to buy shoes that you will sell. Take note, however, that customers like to try shoes on before buying. However, decide on where to sell your shoes. With the advent of technology, selling your shoes could be done at home thus, no need to set up a store where you are going to think of your monthly rental. But we are not saying that setting up a retail store is a big burden instead; making it your goal to achieve.